I see the same dialog when I connect to an FTP server with the Interarchy GUI client. Update: I see this dialog every time I connect regardless of whether I check "Remember password in my keychain". It appears two more times if the OK button is clicked regardless of what is entered in the password field. Permissions 0640 for '/Users/myusername/.ssh/id_rsa' are too open. I find the password dialog extremely annoying and I am sure there must be some way to avoid having to dismiss this dialog SSH needs to access the id_rsa file. Note: I am running Mac OS X 10.6.8. Make sure you have a corresponding id_rsa.pub or id_dsa.pub in your ~/.ssh directory. When I had an id_rsa but not a corresponding id_rsa.pub, Mac OS X kept popping up the dialog and remember passowrd in my keychain did nothing. If you already had your public file there (rename it to another name) and generate the public key again using the above command, you'll notice that the generated and the old one are not equal. Somehow the older versions of Mac OS X generated a public key that Lion does not like anymore, generating it again fixes that. For the curious, the key is exactly the same, the part that changes is that there is no "comments" section after the key on the file any longer. First, run ssh-add -K and check whether this fixes your problem. After doing this, I was no longer prompted to give my private key password. This appears to actually put the private key password in the correct keychain location for OS X to use. Apple has added Technote 2449 which explains what happened. Edit: Apparently specifying a host and key isn't necessary. Just adding this is enough. You have to enter the passphrase for the private key somewhere, and OS X uses ssh-agent by default. If you want to use ssh-agent but want to avoid the gui dialog box, you can use ssh-add to add the passphrase to the agent and then ssh as usual. If do not want to use ssh-agent and instead have ssh prompt for the passphrase, then unset the SSH_AUTH_SOCK environment variable. When you relax the permissions, the key is ignored. You won't gain anything by doing this. If you want to use a key without having to enter a password every time, you have two options. If you check the “Remember password in my keychain”, you won't have to type the password every time: it'll be stored in the keychain with all your other passwords. This is the recommended option. You can create a private key file without a password. You can change your existing private key file so that it isn't password-protected (changing the password only affects the key file, not the key itself). From the command line, run ssh -p, enter the existing passphrase, and then leave the new passphrase blank. There is a security risk in having an empty passphrase: anyone who can access your private key file (for example by accessing your backups) can use it instantly. if you have added your private key to the source ~/.ssh directory, and you have entered ssh-add -K to add it to the keychain, and you have your public key contents copied to the .ssh/authorized_keys (for the correct account) file on the target server the dialog box goes away. it's a tricky combination of files, permissions, locations, and commands so it can take time. i would not rush to a conclusion about bugs. Basically, you need to tighten the permissions on the public key file, and you need to add your key to OSX authentication agent. Be sure that ~/.ssh/ is chmod 700. Be sure ~/.ssh/id* files are both chmod 600. If the problem persists, move your existing ~/.ssh/id* files to your Desktop and try generating new keys using ssh-keygen -t dsa -f ~/.ssh/id_dsa -C you@youremail.tld and see if the new keys work better. I'm on Lion, but IIRC Snow Leopard worked the same way. ps - anyone who suggests using a blank ssh passphrase should be forced to wear a sign so other people know not to take advice from them. Regenerating the public key does not seem to work for me (10.8), nor does generating a new SSH key. If I, for instance, run git pull after locking the login keychain a dialog box pops up to demand the password to the key instead of first attempting to retrieve the password from the login keychain. However, if I kill ssh-agent first, I'm prompted for the login keychain password which then retrieves the SSH key password. I had to do the following steps in order to make it work. The final command should then output something like: Hi <user>! You've successfully authenticated, but GitHub does not provide shell access. I had the same problem. I seem to have fixed it by doing this. 1) Backed up by renaming to old the id_dsa and id_dsa.pub files. 2) Ran a new keygen with a blank passphrase. Works with the launchctl period job monitoring a remote server as well as logging in from ssh in a terminal. So a quick authme remoteserver.com will copy the new remote key over. I think the bug is something to do with the passphrase not being converted over (my old Snow Leopard didn't have one at all). It didn't take more than 10 mins to do. I spent googling forever to see if there were any other mentions of this. This site was the only one! I had a similiar problem. It turned out that the private key I was using was in a wrong format. 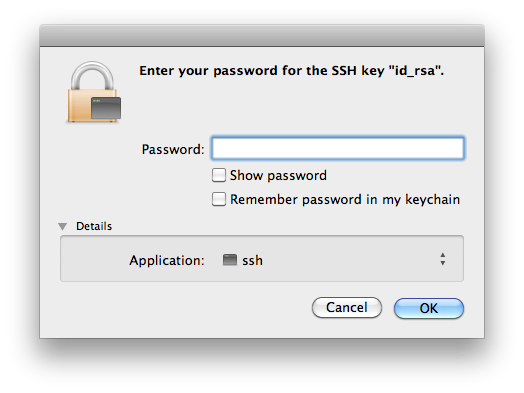 I used PuTTY Key Generator on my Win machine and ssh on OS X expects a different format - Open SSH format. It turned out that the tool I used to generate this key (PuTTY Key Generator) had an option to convert my priv key to the format required by Open SSH. Select Convertsions > Export OpenSSH key. The file you will save contains your original private key in proper (OpenSSH) format. You are using pem format for your private key. This is because Mac uses openssh client which works with pem. ppk is putty's proprietary format and is not compatible with openssh. You can easily convert ppk to pem using putty keygen, in case you have only ppk. The permissions on your pem file is 600. Private keys are only meant to be accessible only by their owner. So, if the permissions give read access to any one else, it will be deemed a security threat. Use the .pem key rather than the .ppk key. Not the answer you're looking for? Browse other questions tagged terminal command-line password ssh .